And thar she blows. The design and aesthetic are quite different to the MI50 we have referenced liberally. Though looking rather hulking because of the three axial 80mm fans - which unfortunately don't turn off at low load - sitting in the metal chassis, the Radeon VII measures 267mm (l), 106mm (w) and 40mm (h) whilst tipping the scales at a hefty 1,281g. Such dimensions are barely any larger than the RX Vega 64, albeit the VII is taller than the I/O bracket by a few millimetres. 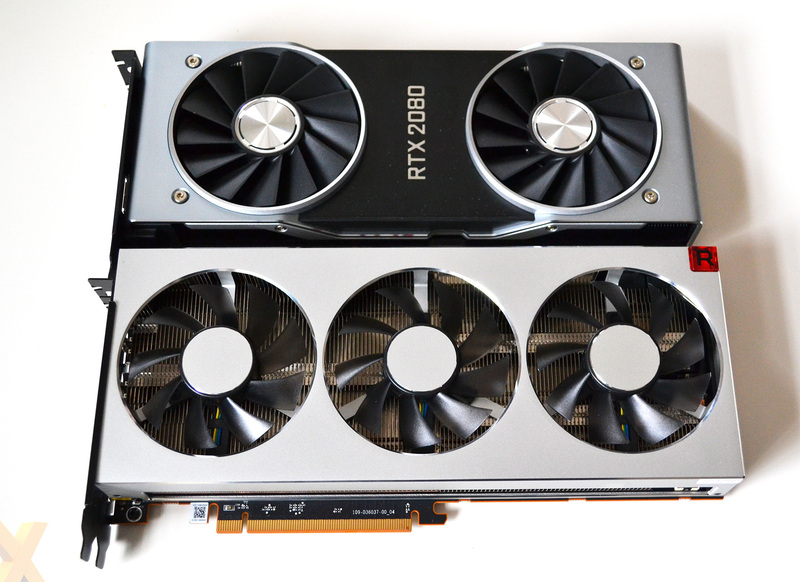 All told, it's a bit bigger than its immediate rival, the RTX 2080 Founders Edition, though we imagine you won't have a problem mounting it inside any decent chassis: just make sure you screw it in properly! We're surprised that AMD hasn't gone with the Radeon logo on the fans, because it feels as if something is missing from the bare central section. Notice how they have such few fan-blades - only nine, in fact - compared to 13 for the RTX 2080, and we wonder if it will have a negative impact with respect to noise. The anodised aluminium construction is easily a few notches up from the RX Vega 64, and the design apes Nvidia's recent industrial look and feel. We still prefer the softer edges and black-and-silver colour scheme of the nascent RTX cards, mind, yet most enthusiasts won't be disappointed with this newest reference card. Everything is securely held together, there is absolutely no flex in the card, and the metal backplate is a nice, necessary touch. Underneath the enclosed chassis resides a full-width heatsink, externally vented on three sides, which also concurrently cools the hot-running components. The design is substantial, as it needs to be for a card that can pull 300W, and like Nvidia, the presence of a well-built, attractive reference board will, in the near future, put add-in board partners in a tight spot. The only interruptions to the aesthetic occur by having a red side-lit Radeon logo and corner cube alongside a pair of 8-pin power connectors. Installed in a chassis, it feels like a premium product, as it ought to do at the £650 price point. 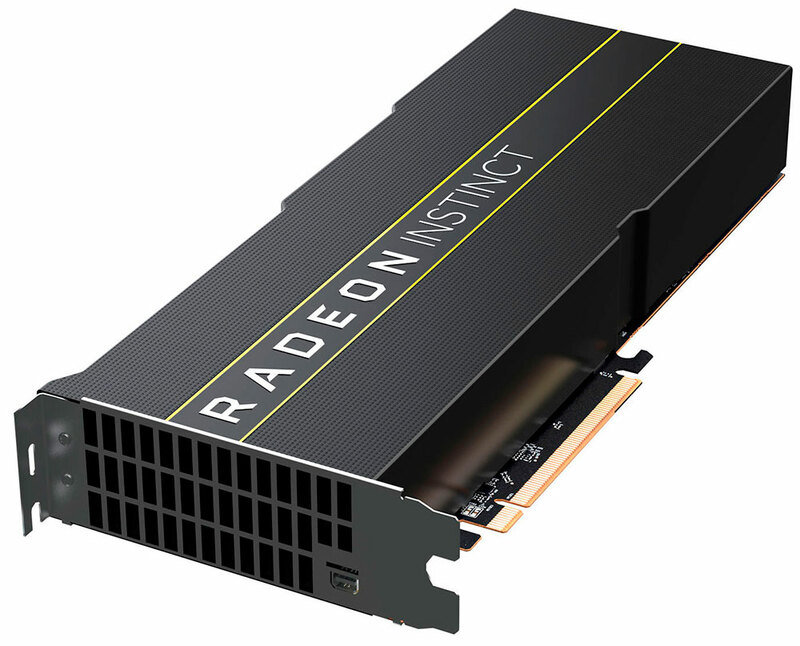 Like Nvidia, AMD favours a contrasting black I/O bracket that's home to a trio of DisplayPort and a single HDMI. As expected, the design eschews the USB Type-C present on the latest RTX cards. Softening the overall blow, AMD's bundling voucher codes for a trio of really solid games: Devil May Cry V, Resident Evil 2 and The Division 2. Nice.